You can sell your own skateboard designs through BoardPusher. Some of these custom skateboard backgrounds cost an extra $10, which is passed onto the artists or designer who created the graphic. Check out more personalizable skateboards . Design a custom skateboard and make it complete with the best components. 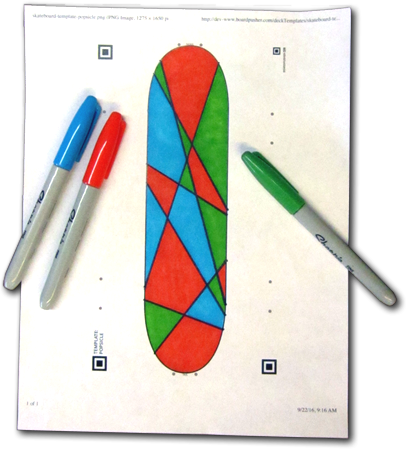 Create your own griptape graphic to make a complete top and bottom custom complete skateboard. Customize every piece of your deck. Create a Custom Skateboard Now! Just print out a skateboard template from your printer, create art on the paper, then just snap a picture and upload to preview your skateboard.